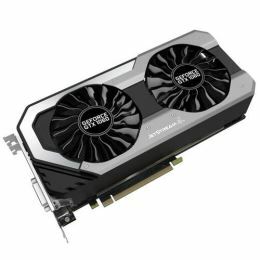 JetStream is Palit’s advanced graphics card design that is featured on their enhanced 1060 cards. It boasts a more efficient cooling system and a unique design with an LED that brings some added style to your PC. With a reduction in noise, an increase in overclocking performance and enhanced cooling the JetStream 1060 is a gaming card to be proud of. Running next-gen games easily and without issues it is a great choice for any gamer. Fancy LED lighting on the 1060 Palit JetStream’s thermal solution provides ambient lighting, further immersing gamers into the gaming worlds - give it a glow. Palit tech keeps this 1060 gaming card silent while you are experiencing multimedia applications and general workload. The operating fans only occurs while working on heavier loading such as gaming or when this Palit 1060 GPU temperature surpasses 50°C. Inspired by the power of jet engines, the TurboFan Blade is designed to improve cooling performance by generating a powerful air stream and air pressure to the GPU. A Dual Fan design offers double the cooling performance, and combined with the Smart Fans, heat is effectively drawn away from hot spots of the GTX 1060. DrMOS, originally only available for high-end server CPUs but is now available in all its glory in the next generation of Palit GTX 1060 graphics cards. DrMOS offers high current circuits, low noise operation, and effective reduction of heat generating to 1060 GPU's. The 1060 JetStream graphics card features dual fans that rotate in opposite ditrections. This Smart Fan system roatates the adjacent fans in different directions to reduce airflow conflicts in the 1060, which effectively improves the overall cooling performance. The 8 phases for those 2560 cores within the 1060 provides unlimited power and minimized current loading for each phase to stabilize the voltage level. This means the overall efficiency of this 1060 from Palit can be improved, the choke noise and EMI noise can also be reduced, for an overall more immersive experience. The design of honeycomb bracket increases the Jet..